I watched an interview with Martine Wright the paralympian who lost both her legs in the 7/7 bombings and I have to say it brought a lump to my throat and really inspired me. After the tragic incident Martine had to re-evaluated her life “I keep asking myself, when does it become normal? Is this normal now?”. 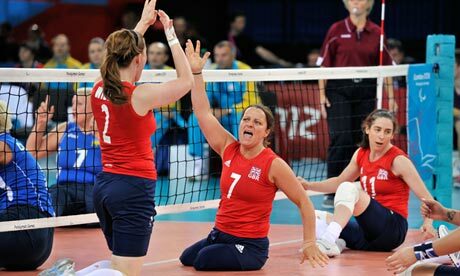 Wright “fell in love” with the sport after turning up late for a “search for a sitting volleyball star” day at Tottenham’s football ground that was attended by just five hopefuls. Six years on, the 39-year-old former marketing executive was diving and blocking at the net, in front of a noisy crowd which included the London mayor, Boris Johnson, actor Barbara Windsor and Wright’s three-year-old son, Oscar, clutching a banner saying “Go, mummy, go”. This is only one story in so many with the competitors and I wanted to blog about it because it truly inspired me and the paralympics is a shining beacon of what can be done with determination, inspiration and a massive amount of hardwork. I truly hope that the legacy of the paralympics is inspiring people of all abilities and ages (the oldest competitor is 71) that they can achieve their dreams and that it breaks down the prejudices between people.